A 50-year mystery as to how mountains beneath Antarctic ice were formed may finally have been solved. Researchers believe the Gamburtsev Subglacial Mountains, which are underneath the huge East Antarctic Ice Sheet, may have been created after a series of dramatic tectonic events. Scientists have been questioning how the range in the least explored terrain on earth was formed ever since they were discovered in 1958. Now the latest findings are revealed in the latest issue of Nature. To help mark International Polar Year, from 2007-2009, the mountains that lie beneath up to 3km of ice, were analysed by a team of scientists from seven nations in light aircraft, using specialist radar and other equipment. Dr Fausto Ferraccioli, of the British Antarctic Survey and the report's lead author, says, "Understanding the origin of the Gamburtsevs was a primary goal of our International Polar Year expedition. "It was fascinating to find that the East Antarctic rift system resembles one of the geological wonders of the world - the East African rift system - and that it provides the missing piece of the puzzle that helps explain the Gamburtsev Subglacial Mountains. The rift system was also found to contain the largest subglacial lakes in Antarctica." By examining the data, researchers discovered how, during the last billion years, a crustal root was formed underneath the mountains and the rift system in the East Antarctic. This fracture stretched 3,000 kilometres, all the way to India. Before life was formed, several continents clashed, creating the original mountains and the root. Between 250million to 100 million years ago, during the time of the dinosaurs, the mountains eventually eroded and the Gondwama supercontinent, including Antarctica, broke, which warmed the root. This later caused additional uplift to recreate the mountains, which were preserved by the vast ice sheet, which at 10million square kilometres, is as large as Canada. Glaciers and rivers formed deep valleys that lifted the peaks to form the amazing landscape that is compared with the Alps in Europe. 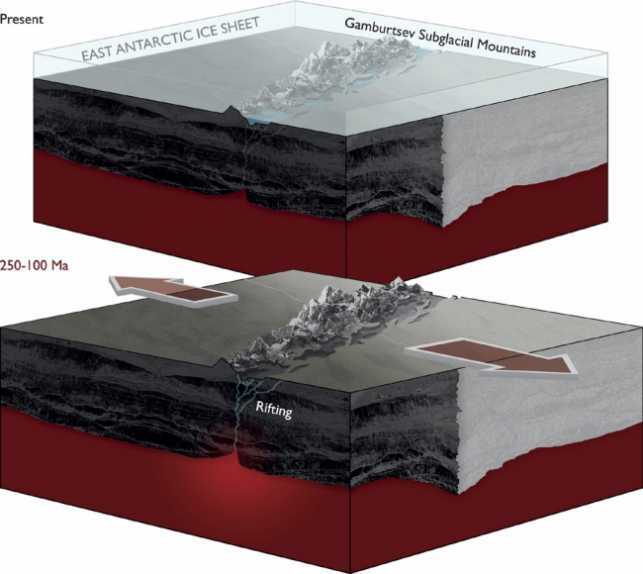 Carol Finn, of the U.S. Geological Survey, a co-author on the paper, says, "Resolving the contradiction of the Gamburtsev high elevation and youthful Alpine topography but location on the East Antarctic craton by piecing together the billion year history of the region was exciting and challenging. "We are accustomed to thinking that mountain building relates to a single tectonic event, rather than sequences of events. The lesson we learned about multiple events forming the Gamburtsevs may inform studies of the history of other mountain belts. The youthful look of any mountain range may mask a hidden past." The results come 100 years after Norwegian explorer Roald Amundsen reached the South Pole ahead of his rival, Robert F. Scott, who carried out scientific experiments and laid the foundation for today's polar studies. Alexandra Isern, Antarctic Earth sciences program director, of NSF's Office of Polar Programs, says, "It is very fitting that the initial results of the AGAP project are coming out 100 years after the great explorers raced to the South Pole. "The scientific explorers of the AGAP project worked in harsh conditions to collect the data and detailed images of this major mountain range under the East Antarctic Ice Sheet. The results of their work will guide research in this region for many years to come." Robin Bell, from Columbia University's Lamont-Doherty Earth Observatory, U.S. AGAP co-leader, spoke of the challenges ahead. "The next steps will be to assemble a team to drill through the ice into the mountains to obtain the first rock samples from the Gamburtsevs. "We have samples of the moon, but none of the Gamburtsevs. With these rock samples we will be able to constrain when this ancient piece of crust was rejuvenated and grew to a magnificent mountain range." The scientists were led by the National Science Foundation, which is an independent American federal agency that supports vital research and education in science and engineering.